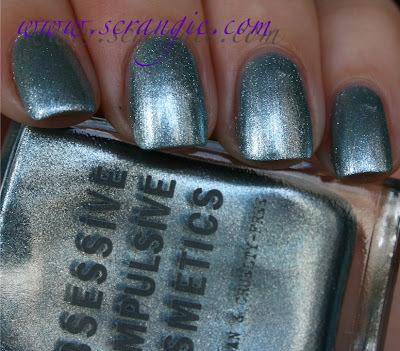 Obsessive Compulsive Cosmetics Arsenic. 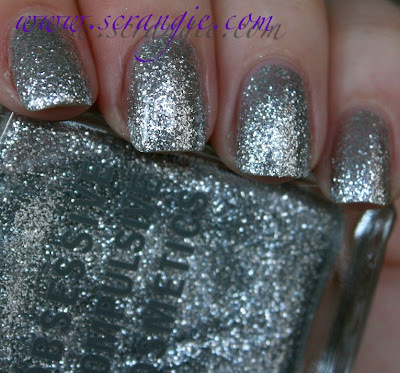 A small-sized silver glitter in a clear base. The density of the glitter is really good in this one, it's not a sheer/sparse layering-only glitter. The shape of the glitter particles isn't all plain round glitter, there's some random irregular shapes in there as well. Compared to other silver glitters I own, this one doesn't sparkle as much and seems to have a dark tone in the background of the color that keeps it from looking too bright and shiny. Obsessive Compulsive Cosmetics Chimera. This is a light, silver-based, blue-toned green foil. This has a less dense texture compared to other foils I own. Obsessive Compulsive Cosmetics Chlorophyll. This is a re-promote, but it's still a great color. It's a vivid neon teal. It's darker than other neon teals (for example, China Glaze Four Leaf Clover), and not quite as neon-radioactive-glowy, but I'd still consider it neon. It's a creme finish, but it's not completely opaque so the finish has a slight jelly quality to it. Obsessive Compulsive Cosmetics Copperhead. A light copper glitter in a clear base. This is brand new shiny penny copper, not weathered copper pot copper. There's some pink in it and it's very bright and shiny. It's also very sparse and I wasn't able to even approach complete coverage with it. This is three coats. Obsessive Compulsive Cosmetics Kava Kava. This is a warm, sandy, peachy beige with silver frost. This one was a complete miss for me. The color is bland and the formula was off. I had a lot of trouble applying it because it was extremely watery and wouldn't stay put on my nail without running and pooling. I also had some strange flakes in my bottle of what I'm assuming is unmixed pigment. This is three coats and it's still a bit sheer. Obsessive Compulsive Cosmetics Phantasm. A light silvery-blue foil. Like Chimera, this has a less dense texture than other foils I've used. Also like Chimera, it has a lot of shimmer to it and doesn't look like a flat foil finish. The formula on these was very mixed. Chlorophyll and Arsenic applied perfectly, very even, good texture, not problems at all. Copperhead was more loose/runny and was hard to build. Kava Kava was a streaky, watery mess. Chimera and Phantasm were thinner and more runny than your average foil, but otherwise had good application. The new brushes are much nicer than the old ones, so that helped application even on the iffy polishes. Dry time is average. Overall, a bit of a random-feeling collection, isn't it? A lot of easily duplicated colors in here (silver glitter, blue foil, green foil), one major dud (Kava Kava), but two that I really like. Chlorophyll, which is awesome, and Copperhead, which is sheer but still very pretty. I don't think I have another small-particle plain bright copper glitter in my collection, but I'm sure others exist. This collection should be available soon on occmakeup.com (I don't have the exact release date), but Chlorophyll is already there if you're itching to get your hands on it before the rest of the shades are added to the site. I do love these shades and it does feel random. Thanks for the lovely swatches! hmm, this collection doesn't seem as good as other spring collections...however, Chlorophyll seems such a lovely colour, might go and purchase it! Great swatches again, but I think I can pass this collection. But are Chlorophyll and Orly Lucky Duck dupes? Nope, definitely not. Lucky Duck is a plain medium green, Chlorophyll is a vivid/bright teal. I like the foils. Chlorophyll would give me major lobster hands though. I LOVE Chlorophyll! Such a great green! I actually REALLY like these! very nice all the shades ! The green and the copper would probably look great together. Arsenic looks just like piCture pOlish's Heavy Metal. And I'd agree that they look pretty random. Sugarpill Cosmetics Haul, Swatches and Review!